It is a great honor and pleasure to host the 38th ASPAC Convention in Hiroshima. On behalf of the Japan District, I welcome you all from around the world. Following Tokyo in 1981, Osaka in 1995, and Nagoya in 2004, this is the 4th time the Japan District hosts ASPAC Convention. 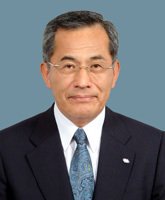 With the slogan of International President Tom Dejulio, “Connect, Inspire, and Advocate”, “Our Children, Their Future” in mind, the Japan District works on the ELIMINATE Project to eliminate maternal and neonatal tetanus, as well as on other volunteer activities unique to Japan to support children in the world. We are more than happy that we will be able to exchange opinions, deepen friendship and understandings in Hiroshima City, a place that represents history and peace with world heritage. May I wish you most enjoyable and fruitful time while you are staying in Japan. Welcome to Hiroshima, the City of Water! On behalf of the members of the Organizing Committee, I would like to welcome all the members of Kiwanis Asia-Pacific. 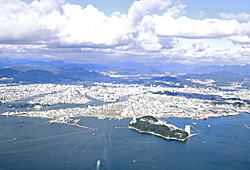 Hiroshima is the center of the Chugoku area facing the Inland Sea which is famous for its scenic beauty. We also have old and new tram cars running in the city, which have the longest combined rail length and the most passengers in Japan. We call this ‘Museum of Tram Cars’. Hiroshima city was reduced to ashes in a moment ,but after that, Hiroshima came back to life and has become much more than what it was before the bombing. Our city gets its life from the professional baseball team, the ‘Hiroshima Toyo Carp’ , the professional soccer team, ‘Sanfrecce Hiroshima’ and the professional orchestra, ‘Hiroshima Symphony Orchestra’. We realize the importance of peace from the bottom of our hearts and we hold the events which have the theme of ‘peace’ every year. In this 38th ASPAC Convention in Hiroshima , we adopt ‘Unite for Children & for Peace’ as one of our concepts. We look forward to a peaceful world where children can grow without anxiety. We expect to discuss issues to the best of our abilities and to strengthen our ties. 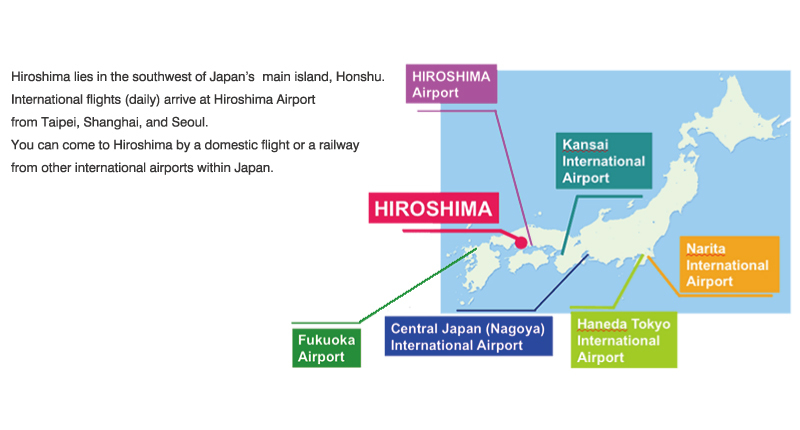 Because the delta resembled a large island, the area was called "Hiroshima," or 'wide island' in Japanese. The town was the seat of the Mori and Fukushima families, and later of the Asano, who laid the foundations of Hiroshima's further development as the most lively castle town in western Japan. 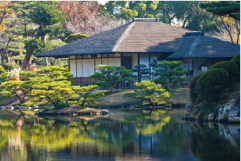 Shukkeien Garden, located in the center of Hiroshima and a designated official National Place of Scenic Beauty, was built during the Edo Period by Asano Nagaakira, then castle lord, as a villa garden. It is popular among Hiroshima residents for its style, typical of the gardens of that time. On August 6, 1945, the first atomic bomb in history was dropped on Hiroshima, killing some 140,000 people. Since then, however, the City has achieved a remarkable recovery from that devastation and has pursued everlasting peace for mankind. 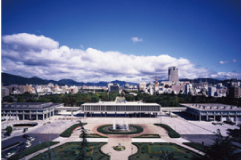 Some 1.2 million people visit the Hiroshima Peace Memorial Museum annually; there is also an endless flow of people who come to offer a silent prayer and flowers at the Cenotaph for the A-bomb Victims, and to the many other peace monuments in Peace Memorial Park. 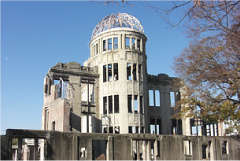 In 1996, the Atomic Bomb Dome was registered as a UNESCO World Heritage Site. It reminds visitors from all over the world of the preciousness of peace. The city of Hiroshima, now the largest city in the Chugoku Shikoku region, is also referred to as the "City of Water." River cruise boats in and open-air cafes alongside the six rivers offer relaxing moments for tourists. At MAZDA Zoom-Zoom Stadium Hiroshima, completed as a new symbol of the city in March 2009, spectators can enjoy not only watching games in different styles with various types seats, such as field seats and party floor-style seats, but also tasting a variety of delicious foods at stands lined side by side along the concourse. 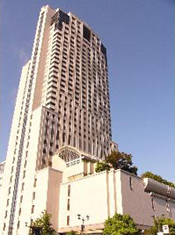 The Convention Hotel will be RIHGA ROYAL HOTEL HIROSHIMA. 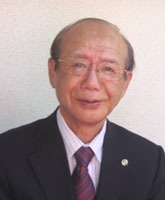 Kiwanis International will hold the 2013 ASPAC Education Conference on March 6, 2013 at Rihga Royal Hotel Hiroshima, the convention venue. Participation to the Education Conference is by invitation only. In due course, the invitation letters will be sent to those ASPAC Kiwanians who are to form the 2013-14 team in the ASPAC region. These invitees will have to be in Hiroshima earlier than the Convention. Let’s walk together to raise funds to eliminate maternal and neonatal tetanus from the world. Reservation should be made through either of the following methods 1 or 2. Then pay your registration fee in the manner explained in "Mode of Payment". 2.Submission by fax or as an E-mail attachment of one of the following documents downloaded and filled out. The exchange rate above is fixed at US$1.00=JPY85. (as approved by the ASPAC Executive Boad on January 7, 2013). For every 21 Kiwanians or guest registered as a group from the same district, 1 delegate is free. Payment in full for Registration is required in advance through credit card or bank transfer. The details are as follows. American Express, Diners Club, Visa and Master Card are accepted. Any fee arising from remittance has to be be paid by the remitters themselves. Please note that the bank account for the registration fee (payable in US dollar) and the Hotel Excursion account (payable in Japanese Yen) are different accounts. Reservation method shall be made through either of the following two methods. Setting of hotel reservation by online shall be a total of four days (March 6, 7, 8 and 9). For those of you who want different date of reservation other than stated above, they shall be made by downloading application form, and transmit them by either FAX or e-mail. 2.Please send by fax or E-mail attachment after downloading the Accommodations & Excursions Application Form(PDF or Excel). * Single rooms of Rihga Royal Hotel Hiroshima are sold out for the night of Friday, March 8. Please choose twin rooms or other hotels for the night. Reservation forms for Hotel accommodation and Excursion shall be notified through Nippon Express Travel’s account by either postal mail or FAX. 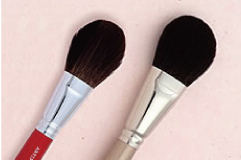 After leaving your hotel, you will visit Kumano town where brushes are highly produced. Kumano makeup brushes are internationally recognized for their quality, and are loved by many of famous cosmetic firms and makeup artists. Now Kumano brushes have established their strong presence in the global market. A few years ago, when Japan's women's national soccer team, known as Nadeshiko Japan, became the Women's World Cup champion, the members received the People's Honor Award from the government. At that time, a set of Kumano makeup brushes was given to them as a supplementary prize. Why don't you look for your favorite brush? After the tour of the Brush Production Studio, you will go to Kure which once developed as a city of shipbuilding and the production of battleships. A famous battleship named Yamato was built there. She is the largest battleship ever built in Japanese history. 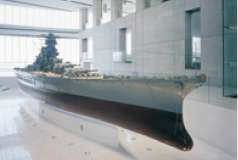 On display in Yamato Museum are a one-tenth-scale model of Yamato, information on shipbuilding, science and technology, and the message of the importance of peace. At the museum shop, you can buy as souvenirs, Yamoto models and ready-made curry named "Navel Curry," the best selling product. You will walk in the Peace Memorial Park to see the A-bomb Dome as a world heritage site, and remaining A-bombed buildings. You will also visit the Peace Memorial Museum. Guides will show you around. After leaving your hotel, you will go to Itsukushima Island by boat, one of the three most famous scenic locations in Japan. Itsukushima island is famous for the Itsukushima Shrine. 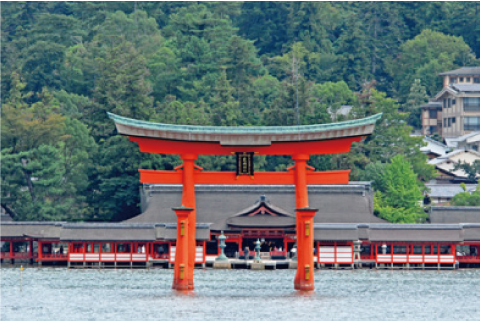 Itsukushima Shrine is worth a visit because it is registered as a world heritage site, and is renowned for the impression it gives of floating on the sea at high tide. You have free time to walk around in Itsukushima Island. There are Daishoin which is the oldest temple in this island, and Mt. Misen which is worshiped as a miraculous holy place. So please enjoy yourselves. After leaving your hotel, you will visit a tea room where you experience the Ueda Soko tradition of the Japanese tea ceremony. The Ueda Soko tradition is a school of tea of the samurai class, and has been handed down to date. You will be explained about the manner and have tea and sweets, where you will find pleasure, exhilaration, and a sense of fulfillment in temporary silence. 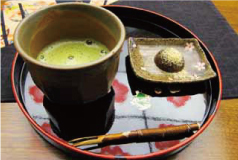 You can learn a part of Japanese culture through the tea ceremony! After experiencing the tea ceremony, you will be bussed to Shukkeien garden, which was designed by tea master Ueda Soko. I hope you enjoy a Japanese scenery garden. 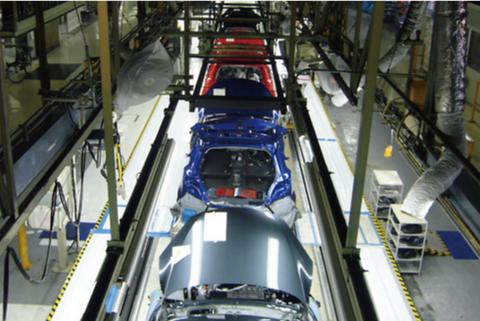 You will visit Mazda where you can see its latest and historic vehicle exhibits, and impressive assembly lines. You can buy Mazda original products at the Mazda Museum Shop. Payment in full for Hotel Accommodations and Excursions is required in advance through credit card or Japanese Yen bank transfer. The details are as follows. Please note that bank account for registration fee (US dollar) and Hotel Excursion account (Japanese Yen) shall be a separate account. American Express, Diners Club, Visa and Master Card are acceptable. In case of the cancellation, written notification should be sent directly to the ASPAC Convention Secretariat. The following cancellation fees will be deducted before refunding. Before February 6th, 2013 There will be a US $25 charge per person for handling fee of refund. After February 7th, 2013 100% of the original sum will be withheld. We will announce you the cancellation policy for the group reservation over than 100 persons respectively. All bank charges will be deducted from the refund. The climate in Hiroshima in March is usually agreeable but a little bit chilly (3.7-13.4℃). Heavy clothing might be necessary. Business suits as well as casual clothing are appropriate. Purchase of traveler's checks in Japanese yen or U.S. dollars before departure is recommended. Most stores will accept only Japanese yen. Major credit cards are accepted in a number of shops and hotels. Foreign currency exchange and cashing of traveler's checks can be done at the Hiroshima International Airport, the New Tokyo International Airport (Narita), the Kansai International Airport and major hotels. You can buy Japanese yen at foreign currency exchange banks and other authorized money exchangers on presentation of your passport. Major banks that handle foreign currencies are located in the downtown area. Banks are open from 9:00 to 15:00 on weekdays, closed on Saturday and Sunday.However, Minor Currency such as Malaysian Ringgit, Indonesian Rupiah etc. may not handle in the banks. The electric supply is 100 volts. The frequency is 60 cycles (Hz) in western Japan including Hiroshima and 50 cycles in Eastern Japan including Tokyo. Every foreign visitor entering Japan must have a valid passport. Visitors from countries whose citizens must have visas should apply to a Japanese consular office or diplomatic mission in their respective country at least three months before the intended date of travel. For further details, please contact your travel agent or the local consular office in your country. The organizer cannot accept responsibility for accidents which might occur during the Conference. Delegates are encouraged to obtain travel insurance (medical, personal accident, and luggage) in their home country prior to departure. Tipping is not required anywhere in Japan, even in hotels, restaurants, or taxicabs. Business hours of most department stores are from 10:00 to 20:00. They are open on Saturdays, Sundays and national holidays, but closed on either Monday, Wednesday, or Thursday. Business hours for retail shops differ, but most operate from 10:00 to 20:00 and are open on Saturdays, Sundays and national holidays. Copyright (c) Kiwanis Club of Hirosima All Rights Reserved.